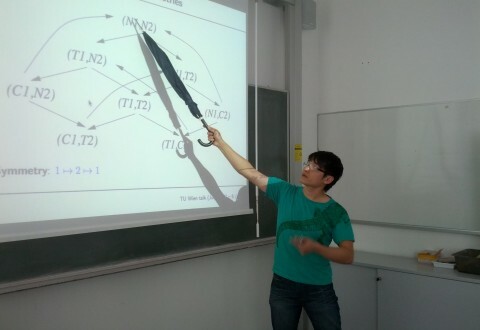 (Mar'19) I have moved to TU Kaiserslautern's Department of Computer Science as a professor. I have a number of researcher openings at PhD and postdoc levels. Potential candidates need to show strong interests in one of the following areas: logic, formal language theory, algorithms and/or programming languages. Contact me if interested. (Dec'18) Two papers accepted for presentations at POPL'19. (May'18) I will be chairing the PC of ICECCS'18 with Jun Sun, to be held in Melbourne (Australia) this December. I will also be chairing the PC of APLAS'19 to be held in Indonesia. Please submit your best papers! Completed PhD in Informatics at University of Edinburgh in 2010 under Leonid Libkin (supervisor) and Richard Mayr (co-advisor). Completed BSc (Honours) in Computer Science and Mathematics in 2004 at University of Melbourne, Australia. My research interests lie in the development of logical methods for programming technologies, which includes constraint solving (especially, over the string domain), formal verification, and program analysis, especially motivated by problems in (i) web security/optimisation, (ii) analysis of concurrent programs with many processes, and (iii) databases. I am interested in all aspects of the field, ranging from theory to systems. In particular, I strongly believe in the importance of theory, tool construction, and case studies to make serious research advances. String solving for vulnerability detection in web applications. Web performance optimisation, e.g., detecting redundant CSS rules. OSTRICH - hitherto the fastest string solver that supports concatenation, replaceall, regular constraints, and other complex string operations like transducers. Sloth - a new string solver that combines concatenation, transducers, replace, regular constraints, and length constraints. SLRP - for automatically verifying liveness for randomised parameterised systems and distributed protocols, and reasoning about two-player reachability games. ParaSymmetry - for automatically verifying/synthesising symmetry patterns and simulation preorder for parameterised systems (see our VMCAI paper). TreePed - for detecting redundant CSS rules in HTML5 applications (see here for a detailed description). ReCount - for verifying integer-manipulating concurrent recursive programs via reversal/synchronisation bounding (see our CAV'11 paper and CAV'12 paper).